We’ve all experienced situations where deadlines are cut, an urgent request needs answers tomorrow, or decisions need extra validation without much budget. Harris 24 is for those moments when you need to canvass consumer opinion from nationally representative populations to targeted audiences, quickly and cost effectively. You can launch a survey whenever you need to. 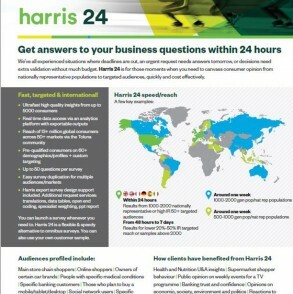 Harris 24 is a flexible & speedy alternative to omnibus surveys. You can also use your own customer sample. Interested in using Harris 24 for your next research project? Want a quote? Complete the form opposite and the Harris 24 team will come back to you directly with an estimated cost for your next project. What a load of Chatbots!